What happens when you’re a fairy who’s different? Rani is a fairy with a disability; unlike all the others, she has no wings. She sacrificed them to save Mother Dove. But when Rani tries to join in with fairy life in Pixie Hollow, she finds her awkwardness and attempts to do her old role in old activities, her failures are mocked by some of the fairies. Rani is upset, even though her friends try to support her, and she runs off to find a place where she fits in. This is a really sweet story that I think will open conversations about tolerance and also maybe to help those children who aren’t understanding of disabilities to stop and think. An enjoyable story, whether or not you’re trying to teach acceptance and inclusion of those with disabilities. In addition to Rani and the Mermaid Lagoon, there is a Small ‘n Cute Fairy Diary. There are also some ads for other Disney manga titles. Highly recommended for anyone who enjoys the Disney Fairy animated movies, loves manga, or enjoys a sweet children’s book. Rani cut off her wings to save Pixie Hollow and her fairy friends, but a fairy who can’t fly is unheard of. After a disastrous accident at the Fairy Dance, she runs away to try and find her own place to belong. 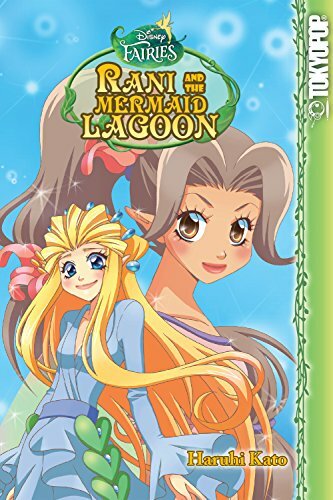 Maybe the mermaid lagoon could be her new home… Join Rani and the rest of the Disney fairies — and mermaids! — on this magical adventure. Add another Disney Fairies manga to your Disney Manga Collection!